I needed to find a decent place to eat at 3pm in London on a recent trip up. Seemingly this is no easy challenge. All the good places understandably shut between lunch and dinner and the prospect of eating in some mediocre chain establishment sank my little heart. 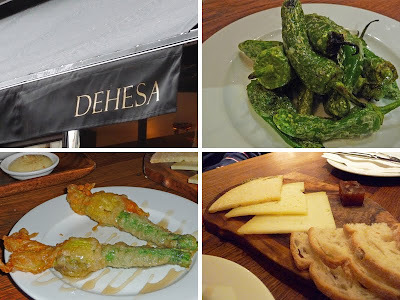 To the rescue came Dehesa, a Spanish/Italian charcuterie and tapas bar. Hurrah! I love tapas, but so often all I get a reheated little plates of overpriced food yet I try and try again. And sometimes it pays off. Things however did get off to a lukewarm start. The Padrón Peppers (£3.65) that I had been hearing so much about were not the taste sensation I was expecting. Pleasant yes, but I was left wondering what the hype was about. But then came in the Courgette Flowers with Monte Enebro and Honey (£7.40). On the face of it it seems a little on the expensive side for two flowers but my goodness, worth every penny once you taste them. The inside of the flower revealed gorgeous, salty, gooey goat cheese that worked incredibly well with the sweetness of the honey. Amazing. Quite possibly the nicest thing I have eaten for a while. Also good were the three Manchegos with Membrillo (£7.15) - one of my favourite cheeses next to Pecorino, Chorizo a la Plancha (£4.00) had a super kick and as I have said before the oil released from grilled or fried chorizo is one of the best tastes out there. Fact. The Prawns a la Plancha with Saffron Potatoes, Piquillo Peppers and Chilli (£6.75) won prettiest plate. I've never had duck livers before I don't think so I ordered them here with Manzanilla, Caramelised Onion, Raisins, Pine Nuts and Migas (£5.75). I loved the sweetness of the dish but they were served very, very rare and although tender, chomping down on raw liver is not my idea of fun. Cooked a bit more for my liking and this would have been a great dish. What WAS a great dish was the Confit of Old Spot Pork Belly with Rosemary Scented Cannellini Beans (£6.25). Crispy crackling and soft, sweet pork. And I'm totally stealing the idea of the rosemary scented beans too. We also had a Classic Tortilla (£4.00) which is always good, Patatas Fritas with Romesco Sauce and Alioli (£3.50), the sauces being better than the potatoes which were glorified chips really and I wasn't keen on the olive oil served with the Chargrilled Country Style Bread (£2.50). I did eye up the charcuterie selections where you could choose from either Italian or Spanish meats but I really couldn't eat a single bite more. Lovely interior, really nice staff in a great location which is open all day at the weekends. A perfect place for a very late and long lunch. So late in fact that it ran right into my next meeting with friends for dinner. Ooof. At £70 for 3 people with only two glasses of wine ordered in total, it isn't the cheapest lunch in London but is a price definitely worth paying. 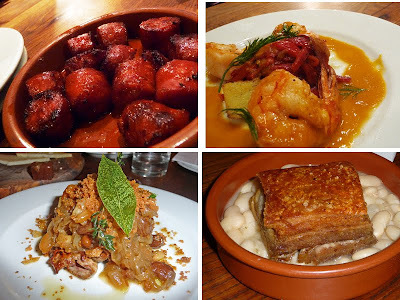 After eating so well at Dehesa I would love to try out their sister restaurant Salt Yard on my next trip up.